I was amazed at how detailed the twinkling stars appeared as I was watched the first game of the 2008 World Series on an HDTV. Then I realized the game was taking place in the Tampa Bay Devil's enclosed Tropicana Stadium. Those weren't stars. They were thousands of individual electronic flashes capturing the first pitch of the game. 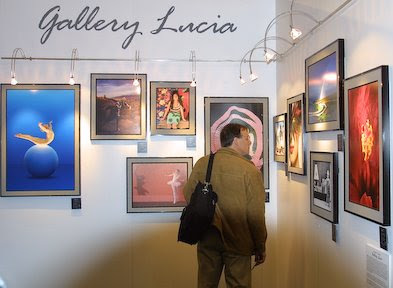 At that same instant, my mind flashed back to the first days of my photographic career when I managed a color lab and processed literally millions of similar pictures for amateur photographers. The events and pictures varied from Friday night high school football games from the top bleacher to parents recording their child's graduation from seat ZZ10, but the results were always the same -- great pictures of the backs of peoples' heads seated 3 to 4 rows in front of the photographer and no image of the event taking place 300 to 400 feet away. The moral of the story is -- like Dirty Harry would say -- "a man (or woman) has to know his limitations." Limitations is the story of your camera's built-in, electronic flash. The camera's built-in flash is extremely convenient and useful within its effective range. When taking a flash picture, the light rapidly spreads out to illuminate the subject (above). A portion of the light strikes the subject and is reflected back to the camera's lens. 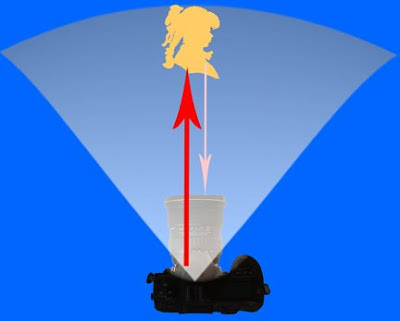 Because of the spreading of the light and the distance that light is required to travel (to and from the subject), much less light returns to the camera than was originally emitted by the flash unit. It's the returning light that determines the aperture setting needed for a correct exposure. The illuminating power of a photographic flash unit is normally expressed as a guide number. A typical guide number for a flash built into today's DSLR is 40 feet at an ISO of 100. Photographers have used this guide number for years to determine the correct aperture setting (temporarily forget about the automatic flash function on your camera). Back to the automation in your camera. DSLR cameras with an automatic built-in flash are capable of electronically determining the distance to subject and performing the math to set in the proper aperture setting. So why did I drag you through this explanation and 4th grade math? Knowing the guide number of your flash unit and this simple equation speaks volumes about what pictures you can and cannot take. If the subject in the example above had been 10 feet away from the camera, the required aperture setting would be f/4. (40 divided by 10 equals 4) This is probably very close to the maximum possible aperture setting of your camera. By the time the subject is 20 feet away from the camera, the required f/2 aperture setting isn't available on your camera. You have exceeded the effective range of the camera's built-in flash. 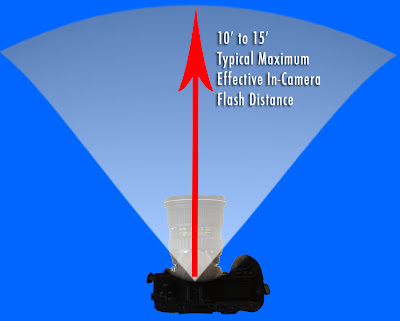 As shown in the illustration above, the typical effective range of the built-in flash units in today's DSLRs is from 10 feet to 20 feet. As you exceed the maximum effective range of the camera's flash, the subject will become increasingly underexposed (darker) until it is completely lost. Remember using a telephoto lens does NOT help this situation. The effective range of flash illumination is always determined by the distance of the flash unit to the subject -- regardless of the lens being used. Estimating the average distance from the bleacher seats to the pitcher's mound at Tropicana Stadium to be 300 feet to 500 feet or more, is it any wonder why these pictures never turn out as expected? But someone will say, "Hey, I took a similar picture, and it didn't look too bad." Truth be told, in these instances, the flash played NO visible role in the exposure. What produced the image was the available light provided by the stadium's lighting -- not the flash unit. Certainly the photographer saw the flash fire, but not enough light returned from the subject to make any visible exposure. It was the stadium light that made the picture possible. If you find yourself in one of these seemingly impossible situations, try turning off the flash and use the light that's available in the arena. It may be necessary to increase the ISO setting to 800 or higher, but it's better than losing the picture opportunity. Note: Guide numbers are directly related to the ISO setting of the camera. The higher the ISO setting the greater the effective distance of the flash unit becomes. This alternative provides a small gain in effective distance, but the trade off will be pictures that show more and more visual noise (grainy appearance) at each higher ISO setting. One final cautionary note: Light emitted by the built-in flash unit "spreads out" at all angles when fired. One of these directions is downward. This becomes important when using wide angle lenses. The flash picture above was taken with a lens that was too wide for the camera's flash. The result is the shadow seen on the lower half of the wall. The dark area is actually the shadow created as the light was interrupted by the top of the lens. Your camera's manual will indicate the maximum wide angle lens to be used with the camera's flash unit. I will end this article with two other examples from my days managing a color lab for amateur photographers and processing thousands of pictures everyday. The first occurred when I covered the premier showing of the Star Trek movie for a local newspaper. After two decades of absence from TV, this movie was long anticipated. Sitting in the darkened theater, I couldn't believe my eyes when Captain Kirk first appeared on the screen and dozens of flash pictures were taken. You can't light up light. I saw those pictures pass through the lab the next day. What did these photographers get in return? Pictures of a completely white screen. The second example occurred every day with a stream of flash pictures people would take of their TV screens. What did they get? Nothing but pictures of a bright flash reflected from the glass of the TV screen. Know the limitations of the flash.